For biological separations, nonspecific interactions with the packing materials are the major source for low separation efficiency, such as peak tailing, as well as low recovery. The unique surface chemistry of SRT SEC packings provides 1) uniform, neutral and hydrophilic coating that eliminates the hydrophobic interactions with proteins, and 2) maximum density of bonding that minimizes the electrostatic interactions with proteins. This specially designed coating allows SRT SEC columns to achieve high resolution and high efficiency separations. For example, uracil, as a test compound is measured at efficiency up to 90,000 plates per meter, as shown in Table 1. Table 1. Column efficiencies (measured using uracil in 0.15 M phosphate buffer, pH 7.0). Loading capacity is critical for size exclusion separation and purification. SRT SEC columns have a stationary phase that is densely bonded on the silica surface which greatly hinders the diffusion of any molecules that would attack the bond of silica-stationary phase layer, thus enabling high stability. SRT SEC phases are compatible with most aqueous buffers, such as ammonium acetate, phosphate, trizma and so on. 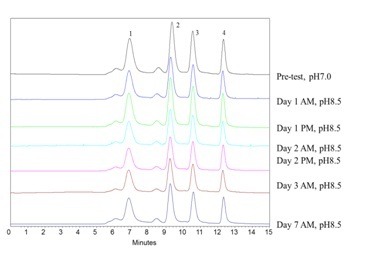 When 150 mM phosphate buffer at pH 7.0 was used as the mobile phase, the average retention time change was within 5% after 100 injections in 45 days. SRT SEC phases can tolerate very high concentration of salts, such as 1.0 M. SRT SEC columns are stable in both organic solvents, such as methanol, ethanol, THF, DMF, DMSO, and so on, and the mixture of water and organic solvents. The controlled surface chemistry used to synthesize SRT SEC phases makes the surface coating very reproducible, leading to very consistent columns. Separation variation from batch to batch is within 5% for retention time. Figure below is a separation of the Sepax standard protein mixture by the SRT SEC-150 columns from three different lots. The largest variation retention time for ribonuclease A is less than 2%. 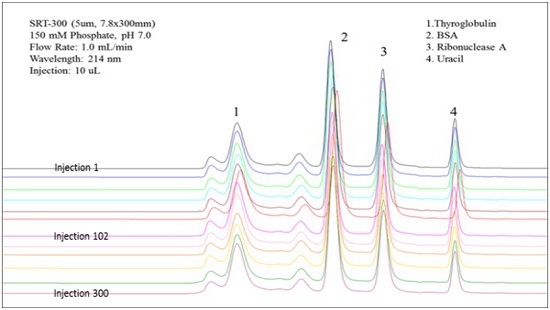 For size exclusion chromatography, individual pore size packings determine the range of molecular weight for separation, while the pore volume controls the separation capacity. SRT's six pore size packings cover the separation of a wide range of biological molecules. 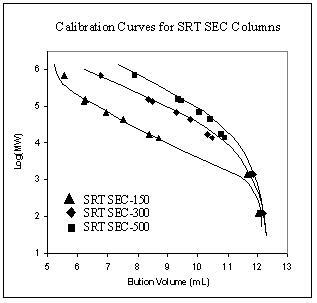 The protein calibration curves for SRT SEC-150, SRT SEC-300, and SRT SEC-500 are shown in figure below. 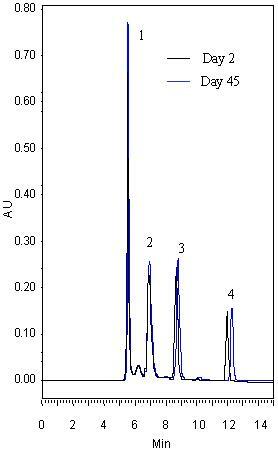 The chromatograms show baseline separation of BSA dimer from BSA for all three SRT SEC-150, SRT SEC-300 and SRT SEC-500 columns. Due to the difference of pore sizes, the retention time for BSA and BSA dimer are different. The smaller the pore size, the shorter retention time for BSA and BSA dimmer. Since the MW of BSA (67K) and BSA dimmer are in the separation range for all those three columns, the resolution (separation factor) for BSA and BSA dimer is slightly varied. Thyroglobulin is a huge protein (MW 670,000). 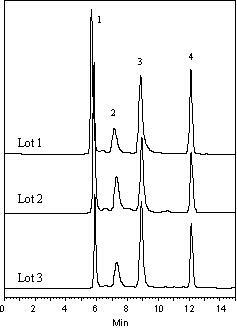 The commercial sample of thyroglobulin contains the aggregate impurity, possibly dimer or tetramer. 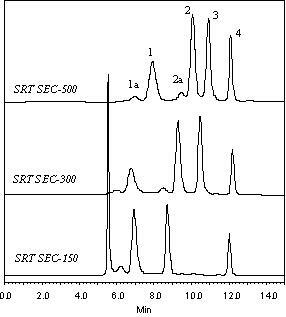 SRT SEC-300, SRT SEC-500 and SRT SEC-1000 provide a baseline separation of the aggregates from thyroglobulin, as shown in both chromatograms. 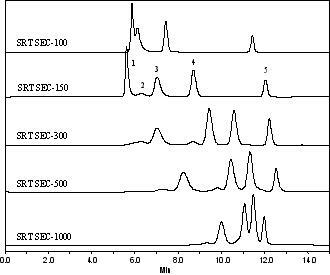 Due to the small pore size of SRT SEC-100 and SRT SEC-150, both thyroglobulin and its aggregates are totally excluded, resulting in a sharp peak. SRT SEC phases are composed of a hydrophilic, neutral thin film that is covalently bonded on the silica surface with the maximum density. Proteins and other biological molecules have negligible nonspecific interactions with such stationary phases. The protein adsorption to the silica surface is suppressed, leading to high recovery and maintaining the activity after the separation. Table below shows the recovery results of BSA and lysozyme, the representatives for acidic and basic proteins, respectively. SRT SEC columns are stable over a wide range of pH from 2 to 8.5. In addition, they can even tolerate higher pH, such as pH 8.5-10 for temporary usage. Figure below shows that SRT SEC-300 phase demonstrates negligible change after running 700 column volume of phosphate buffer at pH 8.5. The temperature tolerance for SRT SEC phases is also excellent. The working temperature can go as high as 80°C.